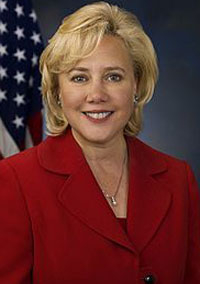 Sen. Mary Landrieu (D-La. ), in a fiery speech on the Senate floor, offered an impassioned defense of a provision that would give her state a $300 million boost in federal Medicaid dollars. The measure, which at one point had bipartisan support, was included as part of the Senate's health reform package passed last December. The bill remains in a legislative holding pattern, however, after Democrats lost their filibuster-proof majority. Landrieu, a conservative Democrat, said that the refigured Federal Medical Assistance Percentages payments are needed to offset a bump in government funding that came on the heels of several weather-related disasters across the state. The cumulative effect of the federal assistance was a temporary increase in per capita income, which created a budgetary illusion that would have left the state short on funding for its safety net hospitals, she said. Conservatives lumped what they have dubbed the “Louisiana Purchase” into a group of targeted earmarks that showed up in the final version of the Senate's bill even though Landrieu has traced the need for the additional dollars going back more than a year. In a speech rare for its directness, Landrieu said she took accusations of “a secret deal” personally and dared any lawmaker who challenged her to prove her wrong. “Never in my life have I ever or will ever throw the people of my state under a bus to save my reputation or my job,” she said.